When we first moved to the Pocono Mountains we would see all the deer and get real excited. Aren’t they pretty? Isn’t nature wonderful? Our real estate agent laughed and told us that within five years we would think of them as pests. He was wrong, It only took three years. We saw the impacts of deer wasting disease and eventually our community had to vote for a deer cull. There was no hunting in our community and the deer population was unhealthy. For the last three years we have been wintering in Florida and I love to watch birds in flight, especially large birds like pelicans. People who live there hate them, especially fisherman. They steal bait, steal the catch, poop all over their boats and stalk them well out to sea. Here is a small group pestering a fisherman in a bay near Captiva island Florida. I must be honest, I don’t remember exactly where this was taken. 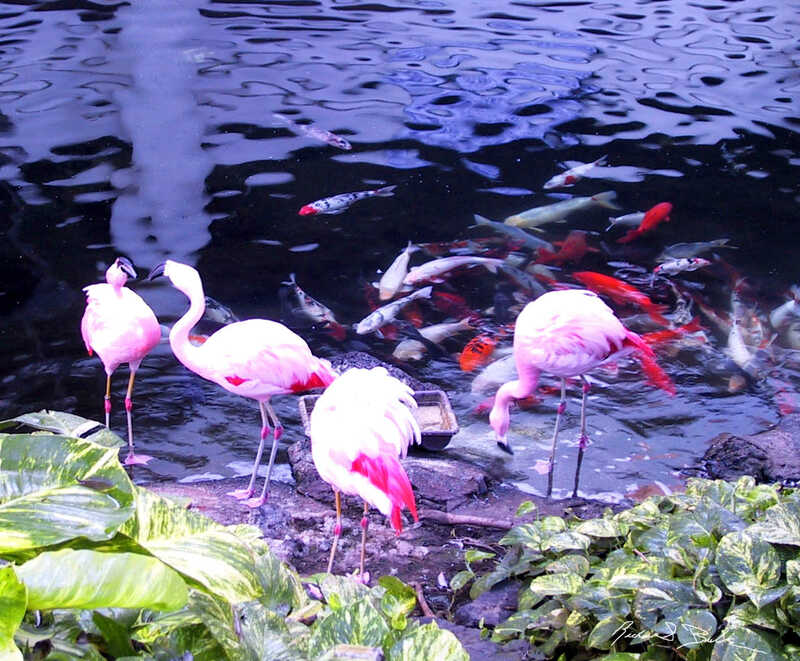 There must be a million koi ponds in Hawaii…OK, I exaggerate. We did seem to visit quite a few on all of our visits to Maui and they are all beautiful. This one however is special since it also feature pink flamingos.